This is the day that I broke the boat. 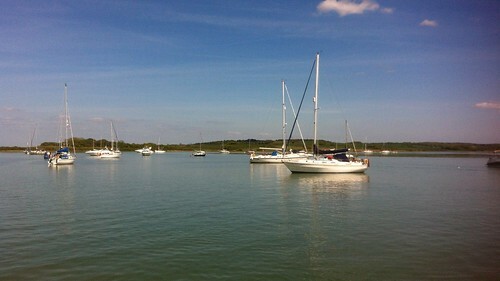 We had a leisurely breakfast in Yarmouth and set out in glorious sunshine to sail to Newtown Creek. We had no real purpose in going there other than to sail Tammy Norie. Our destination for the day was the Junk Rig Association AGM at the Royal Lymington Yacht Club that afternoon. This is the first day we could really sail and try out the rig. The wind was a southerly breeze, making a pleasant reach for Newtown Creek. We just sailed along and tried stuff out. As we were sailing along I noticed the mast wobbling a little bit. I remembered the surveyor’s advice about the mast partners and thought I should have a look. The survey mentioned that the mast needed wedges, and the boat had come with a bag of them, so I thought I could slip them in. 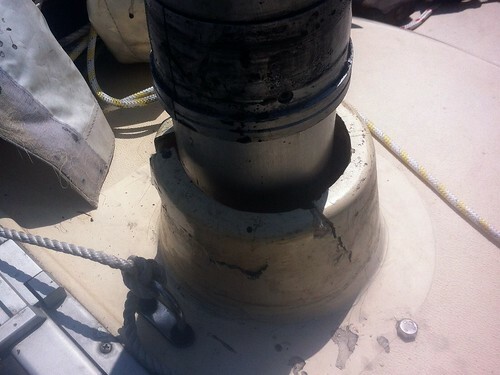 Tammy Norie’s mast is unstayed and sits on a substantial step at the bottom of the hull. I won’t say “keel stepped” because she has twin keels and in any case the step would be well forward of any fin. The mast passes up through a stainless-steel disc about 25cm across and bolted to the coachroof ceiling, then through a cone moulded into the coach roof. 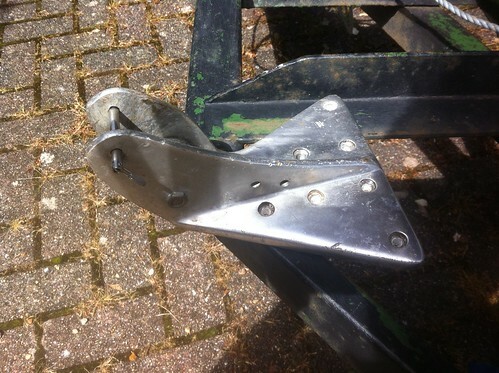 I undid the bolts holding this disc up in order to have a look at how the mast was resting on this cone. 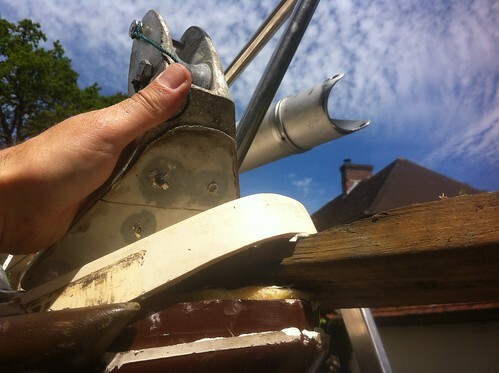 As soon as I removed the disc the mast started pressing against the top of the cone. 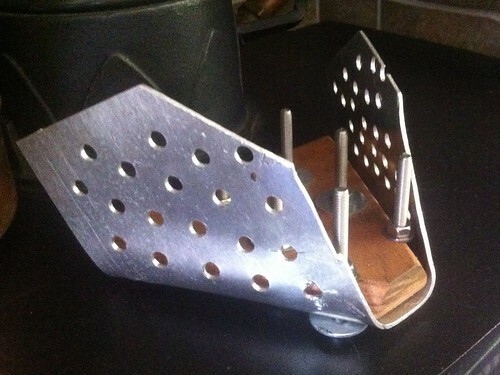 The wedges I had were quite small and I imagined they were meant to go in the thin gap between the cone and the mast. I pressed a couple in. 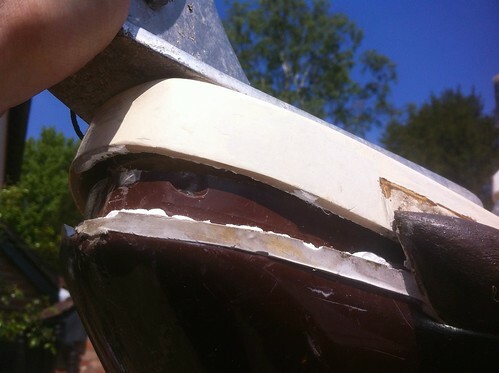 Almost immediately, the fibreglass cracked. 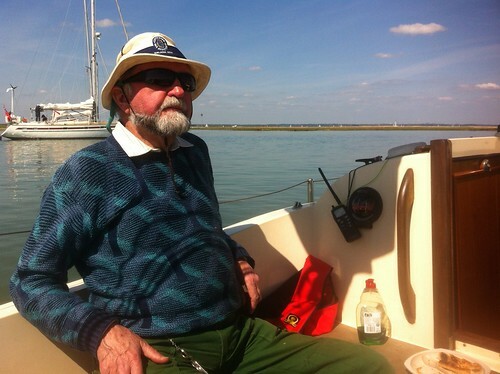 Fortunately, the wind was light and the main movement of the mast was from the chop and wakes in the Solent. 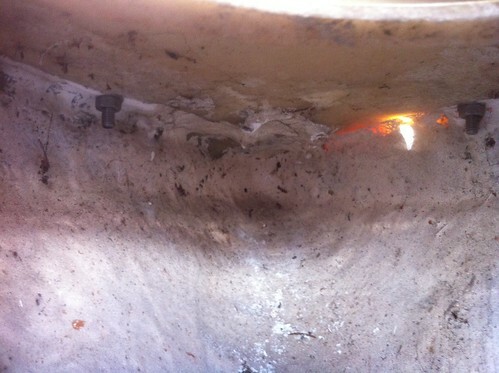 However, those caused the mast to wobble around and bash against the other side of the cone, creating more cracks. 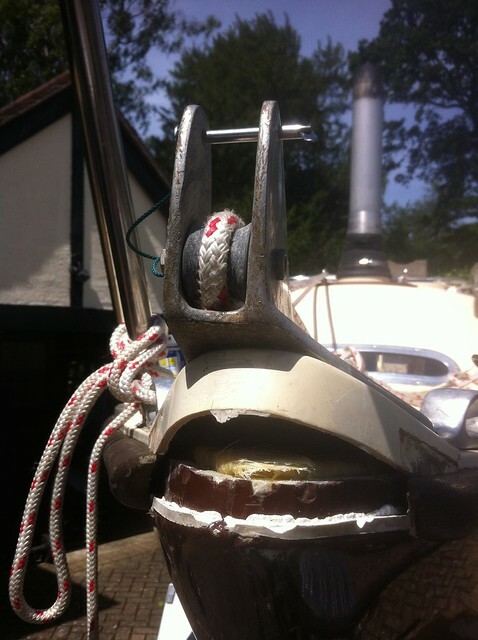 Here’s the cone damage, photographed later with the mast boot off. 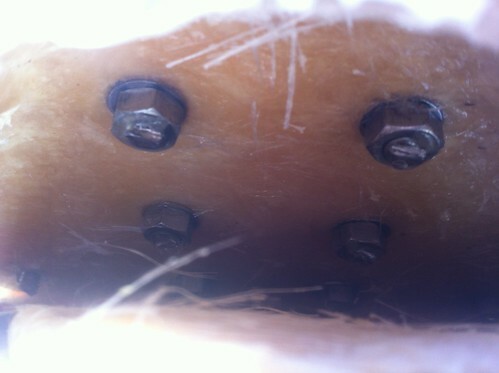 Note the bolt head bottom right. At this point I realised that these wedges couldn’t possibly be for this purpose (I still don’t know what they’re for.) The mast should be braced against the deck at deck level. 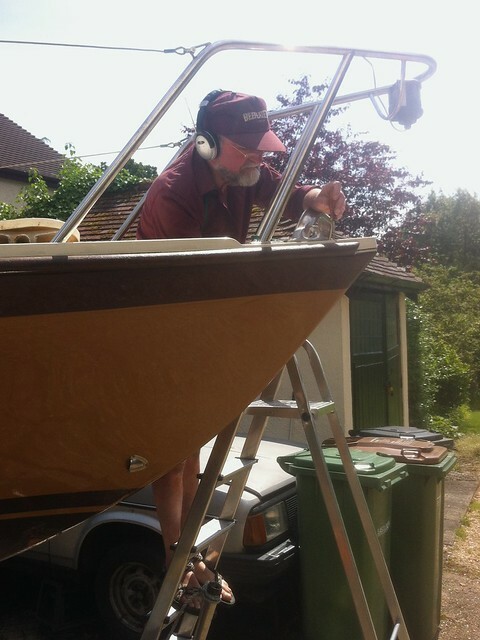 I called to Dad to heave-to to reduce wind pressure on the mast. Then I grabbed a towel that was nearby and stuffed it tightly into the cone, hoping to press it firmly with the disc and brace the mast. I tried to get the disc back onto the bolts. There was no chance of that. The mast was no longer quite vertical and wouldn’t line up. I asked Mum to keep trying while I went outside and hauled on the various lines we had rigged to the masthead. Nearly. Then I threaded a spare halyard through the anchor roller and started sweating it. Success! The disc went on to the bolt. 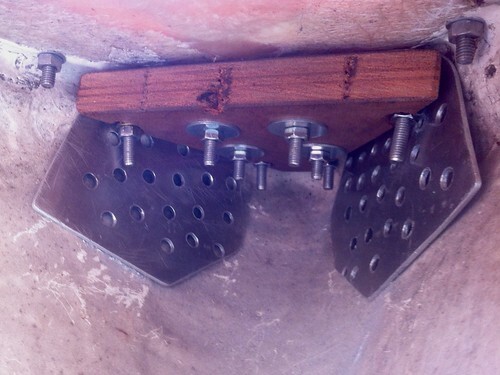 Then there was a horrible splitting noise as the anchor fitting lifted, levering up a small section of deck. I’d broken Tammy Norie’s nose! 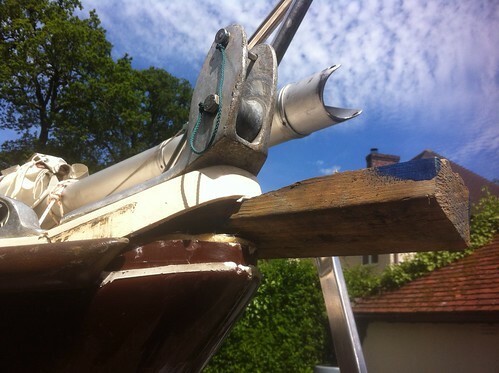 Here’s a photo of the damage when back ashore, with me pressing upwards on the anchor fitting. That part of the deck isn’t fixed to the hull, and was only held down by the general stiffness of the deck and some sealant. The repair, when I do it, will be bulletproof! This was more inexperience on my part. Firstly, I’m used to larger boats and don’t expect to be able to break things with my bare hands. Secondly, I’m used to bermudan rigs where a line from the masthead to the bow (the forestay) can certainly take a great deal of load. 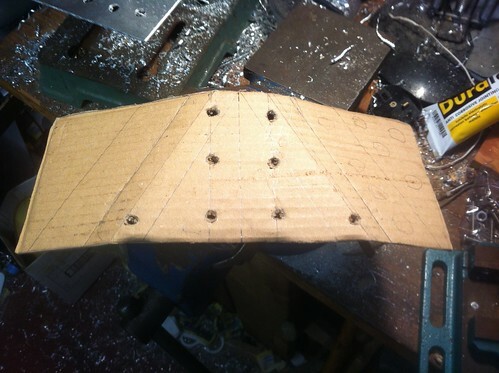 But Tammy Norie’s bow fitting wasn’t designed for upward forces. It’s just an anchor roller on a plate bolted to the deck. At least we were able to tighten the disc towards the coachroof ceiling, squashing the towel into a pretty firm but compliant bundle that held the mast tightly. No more wobble, no more creaking. No more cracks. It’s a good job I knew where my towel was. This is why we try out a boat in the Solent in good conditions. I’m very glad I didn’t try to sail Tammy Norie back from Inverness when I first bought her. So, what I discovered was that the mast was resting on the disc, and that the forces on the mast were being transferred through those bolts to the deck. 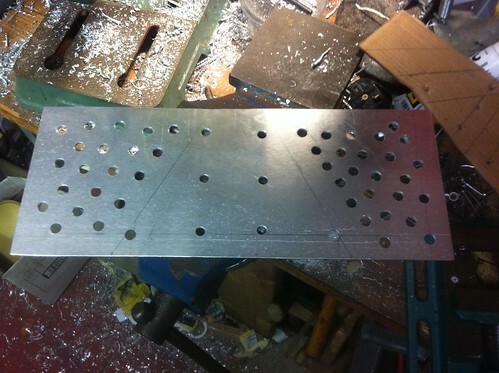 Two 8mm stainless bolts, passing through simple holes in the deck without even a washer, their heads pressing straight onto the external gelcoat. Unacceptable! You can read about the cone repair elsewhere in this blog. After that we had a very nice but brief stop in Newtown Creek and a fairly fast broad reach to Lymington, where we arrived only 10 minutes late for the AGM. The committee were very nice about it, saying that anyone who arrived by sea had a dispensation to be late. After lurking in the JRA for such a long time it was good to meet some members, and the next day we had a lovely junket and an amazing chance meeting. I’ll write about that later!